The stories of the missionaries in Canada aroused the greatest interest in France during the earlier years of the 17th century. Women, as well as men, became inspired with the desire to engage in the conversion of the Indians, and pious ladies of wealth and high birth were led to support the founding of hospitals and convents for the care and training of both the colonists and the savages. Amongst these benevolent ladies were the Duchesse d'Aiguillon. niece of Cardinal Richelieu, who endowed a hospital, and Madame de la Peltrie, a rich young widow of Normandy, who planned the establishment of a school for the instruction of Indian girls. 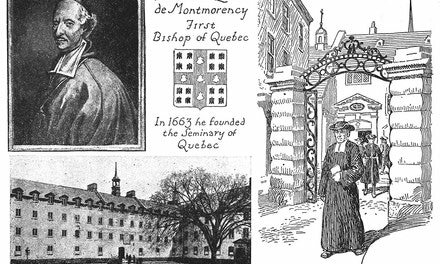 To their devotion is due the foundation of the hospital of the Hotel Dieu, and of the convent of the Ursuline Nuns, both existing in such activity to-day in the heart of the city of Quebec. Early in May, 1639, Mme. de la Peltrie and six nuns, three for the hospital, and three for the Ursuline Convent, embarked at Dieppe, in France, for Canada. For over two months their ship buffeted the Atlantic waves and drifted among the fogs and icebergs of the Gulf of St. Lawrence until it reached its destination at Tadoussac at the mouth of the Saguenay. Here the women missionaries went aboard a small vessel bound for Quebec, laden with salted codfish, which, uncooked, was their only food for several days. At length, on the first of August, they reached the end of their tedious voyaging, and set foot ashore at Quebec. The Governor, Montmagny, successor of Champlain, met them at the landing, attended by his guard of honour, the clergy and the principal inhabitants, while the cannon from the fort on the summit of the cliff thundered a welcome. The sisters fell on their knees and kissed the soil of the land they came to serve. Then, in procession, they all marched to the humble parish church, where they heard mass, and then proceeded, still on foot, for, as yet, there was neither horse nor carriage in Canada, to the fort, to dine. They began their work in a miserable little wooden house near the river side. Soon both they and their sisters of the hospital found their powers taxed by an outbreak of smallpox. For weeks these women, themselves weak from the hardships of travel, and the unaccustomed rigours of a Canadian winter, laboured among the sick and dying victims of this loathsome disease. The woman who started this institution on its wonderful career was a remarkable character. When chosen to be its mother superior, she was a woman of forty years of age, and like its founder, Mme. de la Peltrie, a widow. Born as Marie Guyart, she is better known by her religious name of Mother Marie de I'Incarnation. She had been married, by the wishes of her parents, at the age of seventeen to Monsieur Martin, a silk manufacturer of Tours. He had died within a couple of years, leaving her with an infant son. Marie had always desired to become a nun, but the care of her child and the management of her dead husband's business, which she conducted with great ability, demanded her attention. At last, when the boy was twelve years old, the call to the religious life became so strong, that after a severe struggle with her maternal affection, she placed him in a Jesuit school, and herself joined the Ursuline community. The parting was a great grief to her, and some years later the young man caused her much trouble by his worldly life, but before long, he, too, entered a religious order. 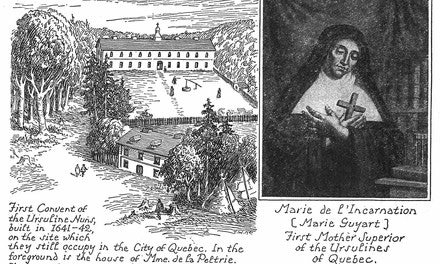 Mother Marie undertook her Canadian mission with enthusiastic ardour, and the rest of her life was spent in unremitting devotion to its service. For thirty-three years she directed its work. She raised money for the support of the convent, she organized the details of the instruction given by her nuns, she administered the finances, she superintended the erection of new buildings, and in the midst of these practical duties and labours lived a life of mystic religious fervour akin to that of a solitary devotee. Under her direction was established the first girls' school in Canada. Here both Indian and white children were trained. Mother Marie herself gave much of the instruction, which included not only the principles of the Christian religion, and reading, writing and cyphering, but also much of what to-day we would call household science. 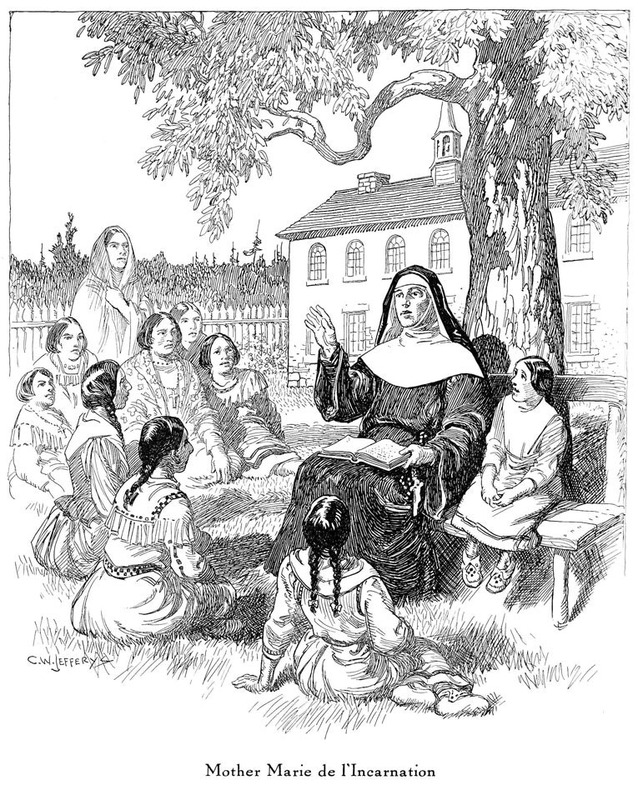 It is recorded that frequently she took her Indian pupils into the open air, and taught them in the convent grounds, in the shade of an ash tree. This tree, shattered by many storms and broken by years, survived until 1873, when its stump was dug out of the garden in preparing the foundations for an extension of the convent buildings. In the picture, Mother Marie wears the black and white robes of the Ursuline Order of the period, as shown in pictures of the time. The Indian girls are dressed partly in the clothing of the French children of that day and partly in their own native costumes. We are told that it was difficult to induce them to wear the clothing of the whites, and it is not strange that they should have preferred their own loose easy buckskin garments and soft moccasins to the tight-laced bodices and stiff clumsy boots or wooden sabots of the French of that period. Doubtless a compromise was made in most cases, and their clothing in consequence was a mixture of Indian and white fashions and materials. In 1642, three years after their arrival, the Ursulines were able to build a humble home of their own in the midst of the woods on the high ground not far from the fort. On this site to-day stands the Ursuline Convent, with its chapel, its long-extended school buildings and dormitories, and its charming garden, hidden in the heart of the crowded city. The ash tree under which tradition says that Mother Marie taught her Indian pupils, shattered by storms and broken by years, survived until 1873, when its stump was dug out of the garden in excavating the foundations for an extension of the convent buildings. It was difficult to induce the Indian children to wear the clothing of the whites, and it is not strange that they should have preferred their own loose easy buckskin garments and soft moccasins to the tight-laced bodices and stiff clumsy boots or wooden sabots of the French of that period. Doubtless a compromise was made in most cases, and their clothing in consequence was a mixture of Indian and white fashions and materials. Walker, Paul. C.W. Jefferys and images of Canadian identity in school textbooks. Kingston, Ont., Queen’s University, 1990. Masters of Art thesis. 130 p. Illus.